Pendant measures approximately 2-3/8" long (including bail) and 1" at widest point. What an Amazing pendant! 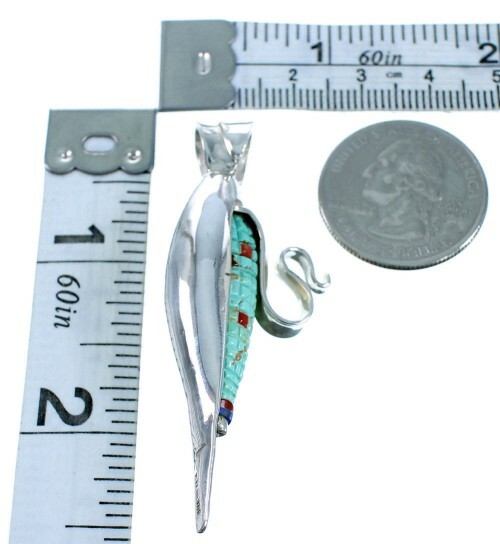 This gorgeous piece of jewelry is hand crafted out of genuine sterling silver and real multicolor inlay. 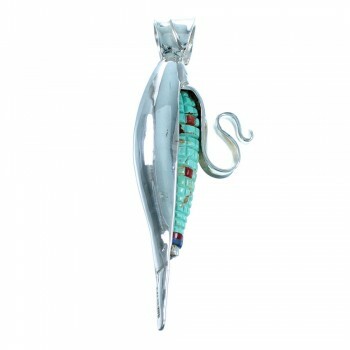 The inlay consists of: Turquoise, Lapis, and Red Oyster Shell. The turquoise is carved to look like individual pieces of corn, then it is gently placed into a corn shaped silver setting. 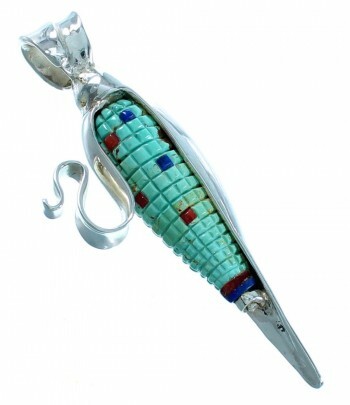 In the turquoise, other stones can be seen resembling different colors of corn. Cut through work accents adding style and creativity to the pendant. The corn is a powerful symbol in many tribes. It is used for prayer of fertility and a good growing season. The pendant is stamped sterling and hallmarked.